Explore the advanced design of the State Premier gas water heaters for residential water heating. See the review of the best features that provide the ultra-efficiency, great first-hour delivery and recovery rate, and how it maximizes the output and prolongs the heater's life. State gas water heaters from Premier series are found in four different groups offering more or less advanced features, where the best ones are helping reducing the mineral deposits while including specially designed heat exchangers for high output and extra efficient water heating. State Premier gas water heaters from High-Efficiency series are Energy Star approved models that are designed with the high energy factor. What delivers the high efficient water heating is the advanced design, which incorporates the patented pressurized combustion chamber and the air intake blower that makes the optimum air-gas mixture. When compared to the standard-type atmospheric-vent models, the advanced design also brings the higher First Hour Rating, but standard venting, water and gas connections. That means that it is easy to replace your old model without an increase in installation costs. The Premier High-Efficiency models are equipped with several features that are similar as found in standard types, such as the venting system, for example, while some features provide better quality, superior design, and technology. Such features include the electronic controls with the microprocessor and easy-to-use LCD display, which results in stable hot water temperature, better temperature adjustment, and control, plus it allows service diagnostics for easy troubleshooting. Instead of the pilot light, High-Efficiency models use the hot surface ignition that will automatically light the burner, for your convenience. An anode rod is also improved when compared to the conventional type, as it uses the powered anode, which makes it non-sacrificial (doesn't deplete over time) and long lasting with the great performance in any water type. A dip tube that brings the cold water inside the metal tank is designed in a way to reduce the sediment and lime buildup and improve the heater's performance. A gas burner is environment-friendly as it produces fewer greenhouse gases than burners found in standard-type gas water heaters. State Premier gas water heaters from High-Efficiency series are available in natural gas only and mainly for heating potable water. Those models equipped with the inlet and outlet connection can be used for space heating applications, as the solar storage heater or as a backup for the solar heating system. Warranty is 6 years. What makes gas water heaters from this series different from other models is the Self Cleaning Turbo Coil dip tube designed with the jet ports so the incoming water will create turbulence inside the tank and reduce the sediment build-up, therefore, prolonging the tank life and keeping the efficiency high. Premier Self Cleaning models are atmospheric vented and FVIR compliant, equipped with the self-powered electronic gas valve that uses a thermopile to generate power for the gas valve and microprocessor for optimized performance. The gas control valve utilizes the LED indicator to signalize the status, monitors the water heating process and provides service diagnostics if there is a problem. Other features found here are similar to the standard type of heaters, which includes the magnesium anode rod, pilot light, and Green Choice gas burner (as the above models). Warranty is longer than offered for the above models, it is 10 years. State Premier gas water heaters with the highest energy factor are coming from Power-vent and Power-Direct vent series reviewed below. They are perfect for homes with the high demand as they supply hot water in a continuous flow, shower after the shower, without the fear that you will run out of hot water. A constant flow of 3 gallons per minute makes them ideal for larger homes and families, with multiple baths, even whirlpool tubs. When comparing to the standard type, State Premier gas water heaters with the Power Vent have a similar footprint as the 50-gallon models, location, and size of the water and gas connection and is as easy to install. The First Hour Delivery, Recovery Rate, and thermal efficiency are much greater. When talking about the installation, this model, due to the lower temperature of the exhaust gases, uses cheaper PVC vent pipe, vs. more expensive metal pipe found in the conventional type. It can be vented horizontally through the outside wall, or vertically through the roof, and with the maximum vent length of 128 ft.
What makes it different from conventional type are the features such as the commercial-grade anode rods, side connections for space heating applications, advanced electronic gas control with the hot surface ignitor and LED lights for troubleshooting. The most important feature is probably the coil-type heat exchanger, fully submerged into the water for the increased heat transfer and maximum output. The highest energy efficiency of all State Premier gas water heaters is found on the Power-direct vent model whose thermal efficiency goes up to high 96%, so it can heat more water with less energy consumption. This power vent model is built tough, with premium quality features, for the fast and constant supply of hot water. The water heater is also equipped with the fully submerged helical condensing heat exchanger installed inside the 50-gallon tank, two anode rods, Low NOx gas burner, and PVC venting. The main differences are the increased power of 100,000 BTU and the advanced electronic control with the LCD display and the heater information, ongoing status of specific conditions, current fault and fault history. With the iCOMM compatibility, the water heating operation can be monitored from remote locations. The group of the State Premier gas water heaters is smaller than State Select series, but the group offers water heaters with the state-of-the-art features and technology, which results in greater efficiency and performance, easy installation and durability. 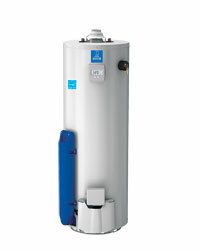 This is what makes them ideal for large and high-demanding homes with the continuous supply of hot water.